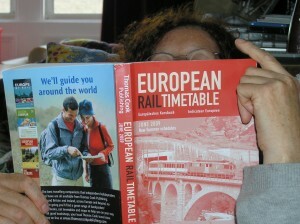 I’m going to note here some of the resources we’ve found use­ful in plan­ning the trip. Rail passes: as the Man in Seat 61 (MS61) makes clear, rail passes aren’t neces­sar­ily the best deal (par­tic­u­larly for us over-26 age­ing hip­pies). The pass looks like it could be a bar­gain, but you must remem­ber that for almost all long-distance/international express trains, there will be a sup­ple­ment to pay. (You could, with the help of your trusty Thomas Cook — see below — plan you jour­ney to avoid trains with sup­ple­ments, but it would be very slow. Great if you want to see lots of coun­tryside, but not if you want to get to Greece in a reas­on­able time.) If you’re trav­el­ling on overnight trains, the pass doesn’t include the cost of the couchette (cour­gette as Callum calls it) or sleeper, which can be quite pricey. Taking all this into account, my spread­sheet cal­cu­la­tions did seem to agree with MS61: it was actu­ally slightly cheaper to buy a series of point-to-point tick­ets. The advant­age of the rail pass of course is that it gives you flex­ib­il­ity — you can change your plans at a moment’s notice, stay longer some­where you like, or move hur­riedly on. So in the end we decided to go for the rail passes. There are vari­ous type of pass, and again MS61 explains the options very clearly. We went for the Interrail Global pass, which cov­ers all coun­tries in Europe (except the coun­try you’re start­ing from). We got the pass which allows 10 days travel within a 22 day period, which seemed to fit our hol­i­day very well. What MS61 doesn’t tell you is that you can buy the passes from vari­ous com­pan­ies, and the prices seem to vary quite con­sid­er­ably! We paid €359 (about £329 back in May) for the adult passes at InterRailnet.Com, but I saw other web­sites ask­ing as much as £455 for the same pass. So shop around before you buy! The next dif­fi­culty was actu­ally mak­ing the reser­va­tions to go with the Interrail passes. We thought that we should at least start by reserving our overnight couchette from Paris to Venice, since it seems likely that will be very busy in the middle of July. There are plenty of web­sites where you can buy train tick­ets online (again see MS61 for detailled recom­mend­a­tions), but very few of them allow you to make only the reser­va­tions. International Rail claims to be able to do this, but the online book­ing part of the site has been down every since I first tried in in mid-May. So we went into the book­ing office at Waverley Station (main rail­way sta­tion in Edinburgh for those who aren’t from around here) to see if we could make reser­va­tions there. “Oh no, we haven’t done that for quite a few years now…” the woman at the counter said, help­fully giv­ing us the details of a travel agent who spe­cial­ised in such arcane mat­ters (the travel agent’s leaf­let had of course been brought in by a cus­tomer, and the book­ings staff had resource­fully kept a copy to pho­to­copy on such occa­sions). Presumably the inter­na­tional book­ings ser­vice wasn’t prof­it­able enough so became another vic­tim of British rail­way privat­isa­tion… Apparently you can make these reser­va­tions at any main sta­tion else­where in Europe — we shall see soon enough. Eventually I admit­ted defeat and phoned up Rail Europe who hap­pily and effi­ciently make my reser­va­tion and charged me an £8 book­ing fee for the privilege. In Lithuania, the ser­vice from Vilnius to Kaunas (Table 1811) has been retimed; these serve Kaunas I (‘one’), the tem­por­ary sta­tion in use due to the clos­ure of the Kaunas tunnel. Don’t leave home without it! Keep it by your bed at all times in case of sleep­less nights. Published monthly since 1883. Greek fer­ries: The inter-island ferry sched­ules are highly com­plex (reas­on­ably enough, since there are so many islands) and they seem to keep chan­ging. But there are sev­eral web­sites which seem to give good inform­a­tion (we’ll see next week how well the vir­tual fer­ries cor­res­pond to the real world: does that overnight boat from Kimilos to Piraeus on Friday night really exist?). The most use­ful seem to be danae.gr and Greek Travel Pages. You can book tick­ets online as well as look­ing up timetables, but we’re just going to buy tick­ets at the port since the prices seem to be the same. Travel insur­ance: I don’t have any­thing par­tic­u­larly inter­est­ing to recom­mend here. We bought ours from Direct Travel in the end — they seemed to offer reas­on­able cover for a reas­on­able price. In the event that we need them, I’ll report on how good they were. We did think of going with ETA, the Environmental Transport Association, par­tic­u­larly when we saw on the web­site that they were offer­ing a 25% dis­count for people who were not fly­ing. It turned out that the dis­count only applied to annual policies, and the woman on the phone kept assum­ing we were going by car, which was a wee bit disappointing. This entry was posted in Greece, resources, trains, travel by chris. Bookmark the permalink. Thanks for the broad beans, they were delicious!